We are an independent family run business supplying quality fitted kitchens direct to the public for over 20 years. All our cabinets are 18mm and supplied colour matched to the doors, with a solid 18mm back in the base units, giving you a kitchen that will last for years. We use Blumotion soft close hinge and drawer systems as standard on our cabinets. Choose from a large range of modern high gloss kitchens or matt painted both with handleless options, traditional, wooden and vinyl. 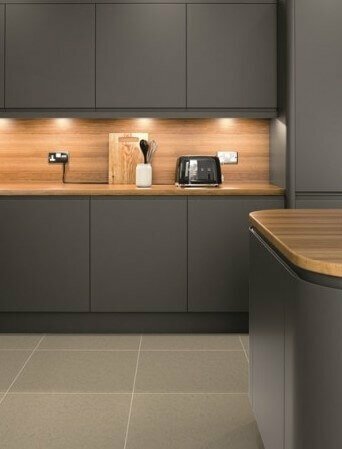 We can also supply worktops of every sort from laminate, granite, composite and encore. We have saved some of our customers thousands of pounds on the same design they have seen at other retailers. You can have your kitchen supplied flat packed or rigid built, we also can make bespoke units to your size requirements. We can provide a free plan and design service so you can see what your design will look like with our 3D cad software. Please take your time to browse our website, you can order online, or e-mail your list of fitted kitchen units and let us contact you. We provide a nationwide delivery service for all our products and usually deliver to the London area every week in our own vehicles. If you need any help please feel free to contact us or come and visit our factory showroom. There are always a lot of questions in the process of choosing furniture for the kitchen. And it is not surprising. The requirements for the kitchen can be very special. How to choose a kitchen that will be ideal for you and your family? The time for standard kitchens has long passed, now consumers are looking for a variety of colors, materials and styles of furniture. Ask what are the main features of the desired kitchen. Undoubtedly, the answer will be: "Coziness and comfort." 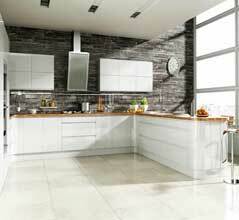 We offer wide range of fitted kitchens that will definitely satisfy needs and demands of any kitchen. It should be noted that our fitted kitchens can be made to individual orders, this allows us to focus on the wishes of our customers and create a unique interior, taking into account your individual preferences. Try to make the kitchen as comfortable as possible, because this room will meet you in the morning, in the afternoon, and in the evening, and even if you are not home for a long time, the kitchen should keep exceptionally positive emotions. Only then you will enjoy the process of cooking, and your family dinner. Our goal is to create the most optimal product that will totally meet your requirements and your idea of convenient, high-quality and beautiful kitchen. • How many members of the family should the fitted kitchen be designed for? • Can two people cook at the same time? • How often are you going to eat in the kitchen? • How many people will sit at the table? • How often do you cook? Maybe you just drink coffee in the morning, have your dinner at workplace, and prefer something light for supper. Or maybe you cook only on weekends. Think about what you need for a comfortable cooking: a dining or a kitchen table, or maybe a folding table will be enough. What are you usually doing in your kitchen? Maybe you have cooking hobbies or you like to work in the kitchen in the evenings. What are your color preferences of kitchen furniture? The choice depends not only on your personal needs and preferences, but also on the lighting, the color of the walls, the floor, the ceiling. How are you going to use the available space? Are you satisfied with the size of the existing room? If not, how will you increase the area? Move the wall or combine the kitchen with the living room? What surface area do you need? What is the height of the table? What kind of household appliances do you plan to place in the kitchen? How many products do you store in the fitted kitchen cabinets? Do you need shelves for vegetables or house preparations for the winter? How do you want to organize your workplace? Think about how it will be more comfortable for you and your family. Do you need a place for feeding your pet in your kitchen? Does the room needs to be repaired? If yes, then it must be finished before buying a kitchen unit. Where do the windows of your kitchen go? Lighting also affects the choice of color - if the room is dark, you should choose warm and light colors - beige, peach, yellow, orange and sand. 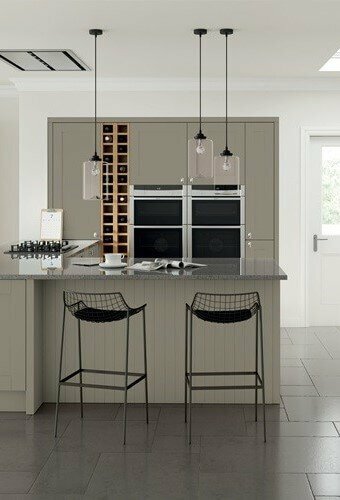 The light kitchens look good pastel shades and white with bright accents. After the general wishes for the kitchen are determined and the budget is calculated, you can proceed to detailed planning and selection of materials. Any kitchen is divided into three main zones: a cooking zone, a washing zone and a storage area. For your convenience it should be planned on the principle of a triangle connecting these zones. It is desirable that the total distance between the points does not exceed 6 meters. The ideal distance between them is 1 meter. It will be perfect, if all working surfaces of the kitchen will form a single line, but if the size of the kitchen does not allow to organize it in that way, then the gap should start where one of the main zones ends. The most reasonable linear for small kitchen is L-shaped layout, in large rooms U-shaped fitted kitchens with a large number of working surfaces can be optimally arranged. Compact kitchens dictate more stringent planning requirements. For maximum comfort, choose cabinets with sliding doors and try to use every meter of space rationally. For example, in the gap between the working table and the refrigerator, you can place a narrow drawer for bottles. In the spacious kitchen you can buy a suite with sliding and swinging cupboards. The kitchen should be compact enough not to wind up kilometers - and at the same time spacious. The contradiction is solvable: you can leave only the most necessary furniture and abandon the top hinged cases. Now it is important to place storage systems in columns - this makes the kitchen visually easy, soaring. The kitchen should be absolutely ergonomic in everything, down to the accessories. There are no trifles: you need to check that the handles are comfortable for both men and women: when you open the door, you should never risk your manicure. We are necessarily paying attention to such details when creating fitted kitchens for you. Your kitchen is often the centre point of your home. It is the room that takes the most planning, what colour and style to choose, what finish to go for, what type of worktops to fit and most important the kitchen is the most expensive to buy and install. Here at Discount Kitchen Factory we try to get the balance right so that you get really high quality kitchen cabinets but at a cost and price you can afford. The cabinets we supply are made in 18mm MFC fully sealed all round so no moisture can be absorbed, we use a solid 18mm full height back panel in all our base units. This make the cabinets very strong, cheaper supplies use a hard board back but after a couple of years this can bow from moisture absorption and make the cabinet weak, making the doors hang unevenly. We use Blumotion soft close door and drawer systems in our kitchen units that carry a lifetime warranty so your doors and drawer close smooth and softly time after time. All our kitchen units come with fully adjustable legs that can be raised or lowered by 20mm each way so uneven floors can be accommodated. Our wall units have concealed hanging brackets which are easy to level and fix your unit safely to the wall. If you choose to have your kitchen supplied rigid built then we deliver it in our own vehicles, every unit is checked and loaded with care and delivered to you by our own driver so you get a trouble free delivery with no missing parts. 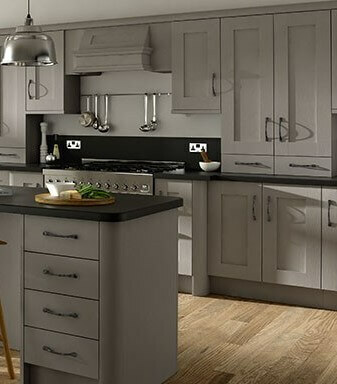 We don't just have a large range of different coloured kitchens but we also supply colour matched carcasses with most of our kitchen ranges, so if you order a light grey kitchen the unit inside and out is light grey so you don't see any white areas around the door. 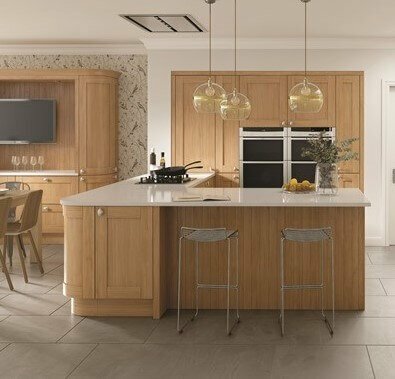 We always want our customers to have a kitchen they will love for years to come so we are always here to help with planning and design and installation of all our kitchens. 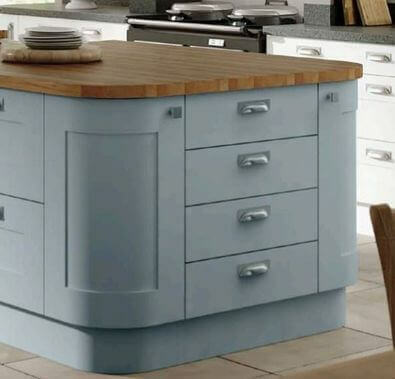 We supply both quality 18mm flat-packed and rigid built kitchen units. We can supply colour matching units , fitted with soft close drawers and runners. These are not cheap inferior units that you might get from DIY stores, they are high quality units that will last for years, they are made to take any type of worktop including granite. Over 35 different styles Choose from a large range of quality wooden and standard size doors. Styles available include traditional Painted French oak, vinyl finishes and shaker style, for new kitchens or replacement doors. Stunning ultra modern frameless glass doors. Available in 4 colours. 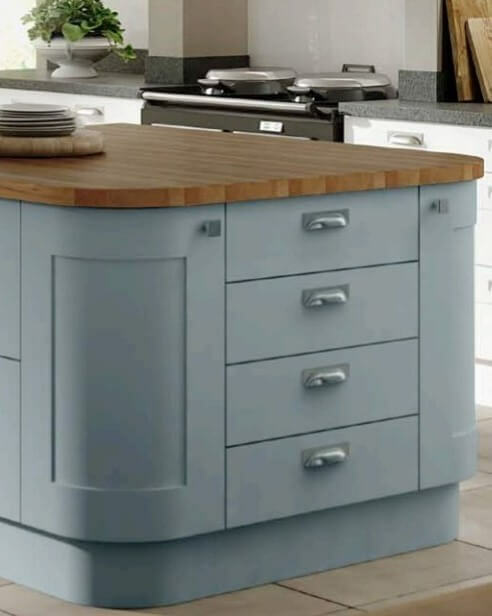 The Shaker style is still a very popular design that ia available in many different door types and colours we have both both standard and made to measure sizes. Large range of pull-out units, veg baskets, larder units and corner solutions. Large range of knobs and handles available, Classic, Contemporary and Traditional to complement both kitchen and bedroom doors or to re-vamp your existing doors. We will supply almost all makes of appliances. Ovens, hobs, ranges, chimneys, fridges, freezers and dishwashers. Ring or e-mail to give you a quote. We realise that when buying a new kitchen there are many things to consider. Here are some of the main points you need to look out for. The quality of the kitchen units or carcasses as they are called in the industry. These need to be 18mm thick if they are to last for many years, some companies try to cheapen the cost by putting in thin hardboard backs on the base and wall units. These might look good when they are first installed but after twelve months or more the thin back panel can start to bow as it absorbs moisture out of the atmosphere especially on the base units if there is a little dampness on the interior walls which can be the case with older properties. These types of kitchen units are usually massed produced for the big DIY shops using cheaper materials to keep cost down, but is it really cost effective as the kitchen might look that it needs to be replaced again within just a few years. Also look at the back panel in the base carcasses does it go all the way up to the top of the units, or does it only go part of the way up leaving a gap so that you can see the wall when it is fitted, again this is done to keep cheapen the cost of the unit but it can affect the strength of it. 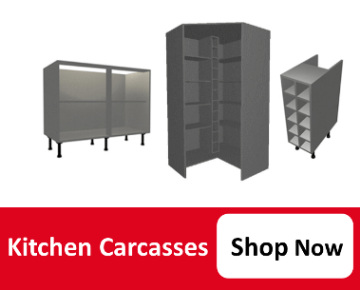 Look for 18mm kitchen carcasses with a full 18mm back panel, even on our cheaper ranges of kitchens we sell, we still have a 6mm solid back panel to keep the unit strong that will then last for many years. Also do the kitchen units have a service gap in the back? Ours have, this is so you can make cut-outs at the back of the units for pipes and other fittings without cutting into the inside of the unit that will make it look mess when you open the door. With our free design service you can see the finished result before it is fitted.